Phyllotreta undulata the large striped flea beetle, Phyllotreta nemorum the turnip flea beetle, Phyllotreta atra, Phyllotreta cruciferae, Phyllotreta nigripes and other species. Tiny beetles of the Chrysomelidae order and Alticinae superfamily. 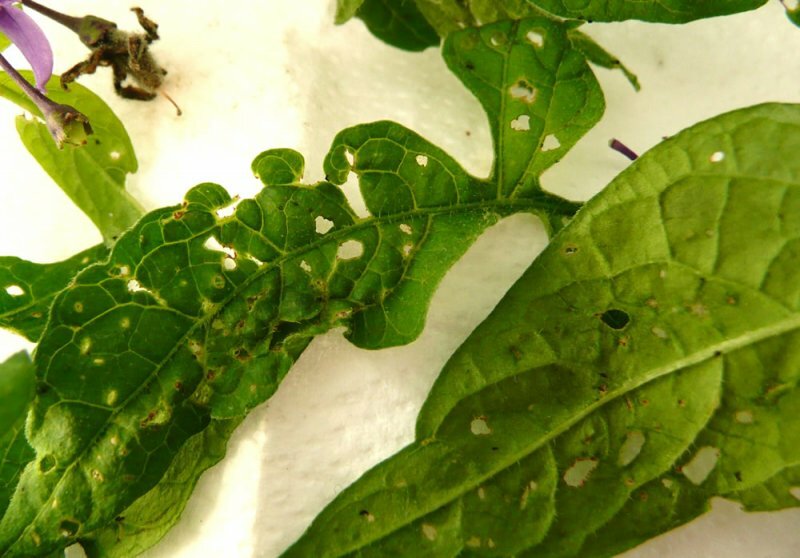 You are here: Oakleaf Gardening > Problems > Flea beetle - Phyllotreta spp. Flea beetle - Phyllotreta spp. Damage can be identified by small, neat, round holes or pits approx 2-3mm across appearing in young leaves. You may also see the 2-3mm long, black or metallic-blue beetles with yellow bands on their wing cases (which eat on the upper surface of the leaf) jump when disturbed. The adults hibernate overwinter in plant debris, emerging in early spring and moving onto young plants to feed. They can fly up to 1km to reach new sources of food. Females lay eggs in the soil near plants in May and June. The larvae of the large striped flea beetle then feed on leaves, other species feed on roots, before pupating in the soil. The next generation of adults then emerge from pupation in August to October and feed for a few weeks before hibernating. The beetle consumes foliage, slowing growth and making the plant look unsightly. Young seedlings may be killed. Some species also act as vectors, transmitting the radish mosaic virus and the turnip crinkle virus. The larvae can also cause damage by feeding on roots or mining leaves. Often attacks leafy vegetables, radishes, stocks, wallflowers, alyssums and all other members of the brassica family. Some species have also started to attack outdoor fuchsias and other garden plants. It is particularly prevalent during warm and dry spells in April and May. Ensure plants are well watered in dry weather. Take particular care of seedlings to promote rapid growth so they are less vulnerable. Susceptible seedlings can be covered with fleece for the first two weeks of growth to minimise damage. Clear away plant debris, particularly in autumn, to ensure there is nowhere for them to overwinter. A serious attack can be treated chemically by spraying with pyrethrum, or a synthetic version such as bifenthrin.